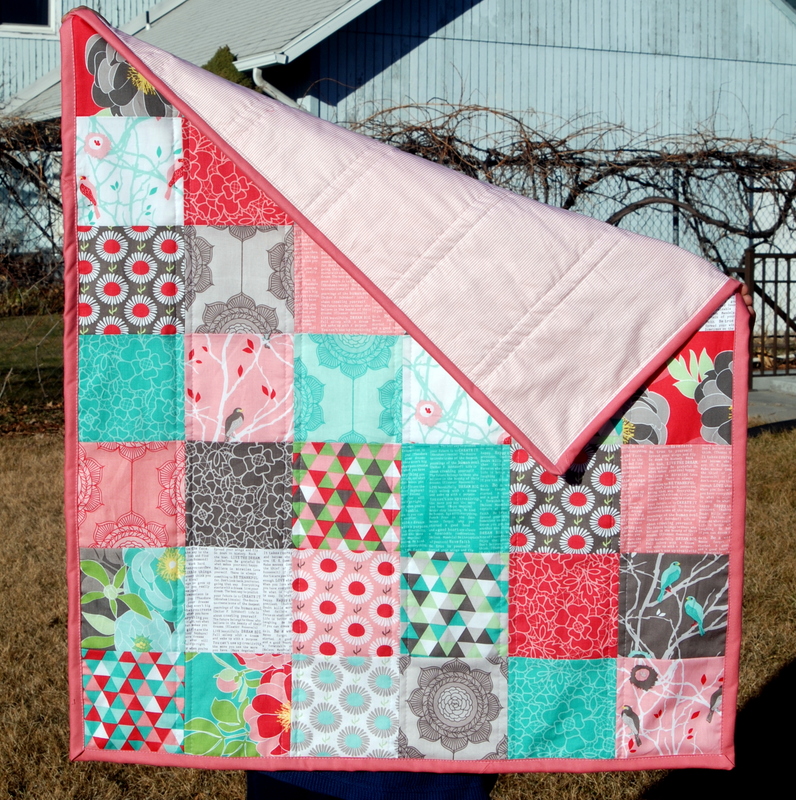 This is Cottage Garden by The Quilted Fish for Riley Blake. It is one of my all time favorites, and I made an identical one for myself using a layer cake. 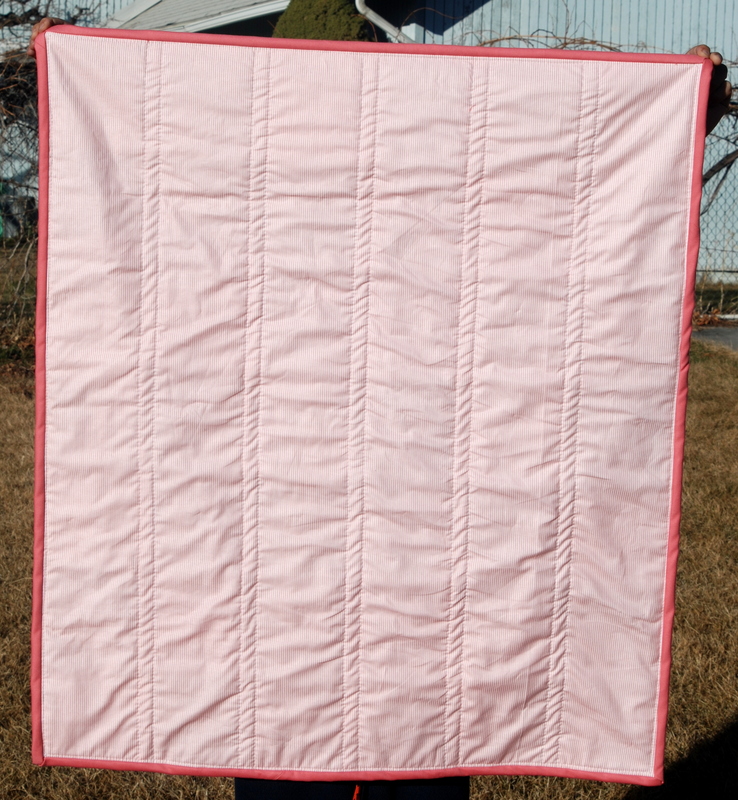 The back of this one is adorable light pink stripes by Dear Stella and is bound in a Kona Solid. I quilted it vertically in straight lines on either side of the seams. This is another fabulous line called Color Theory by V & Co. for Moda. 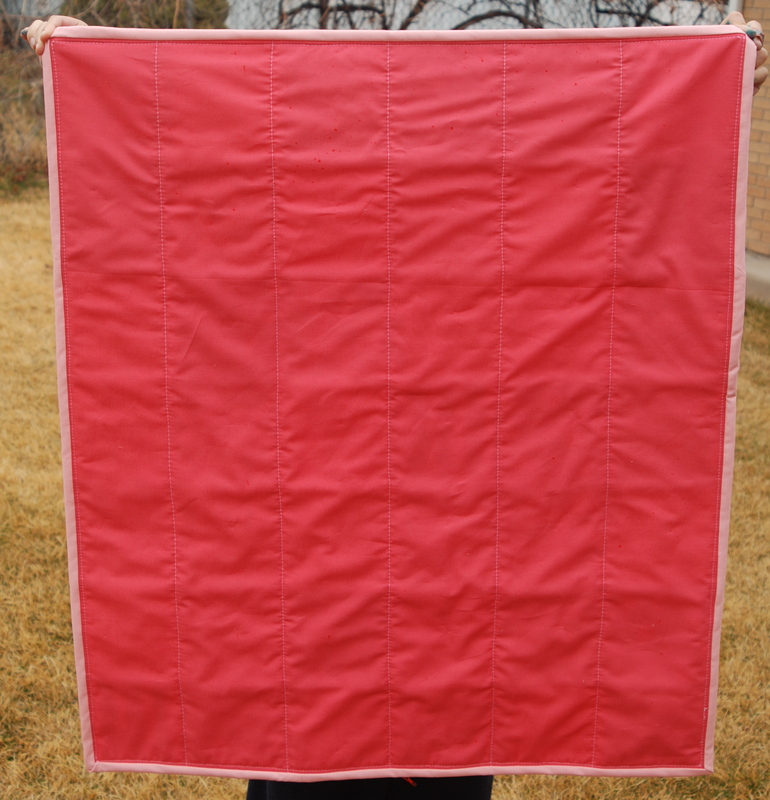 This one I quilted vertically down one side of the squares, backed it with a beautiful pink Kona Solid, and bound it with a light pink Kona Solid. 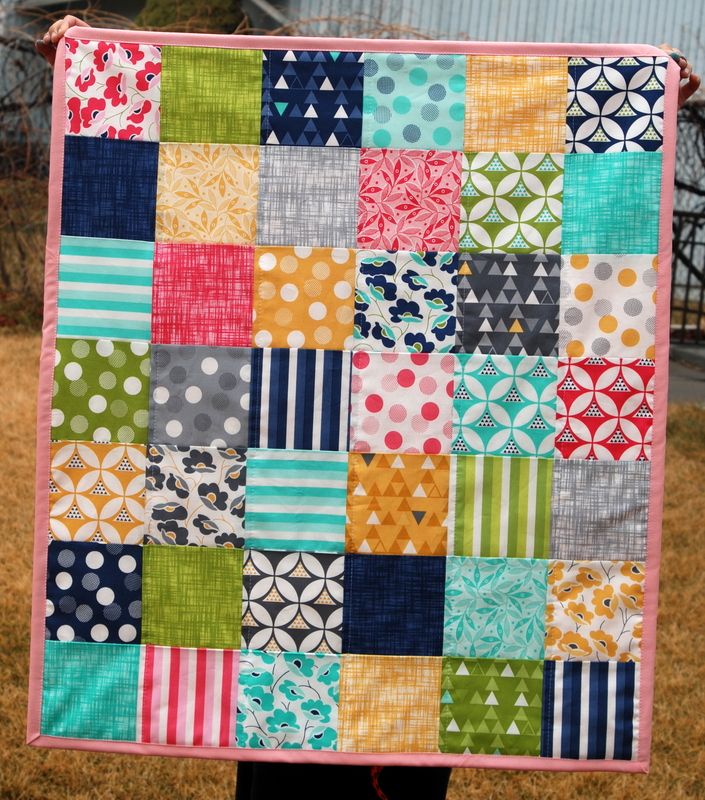 This Color Theory Quilt is in the shop! This line is Sasparilla by Riley Blake. It is ridiculously adorable, and is perfect for a boy or a girl. 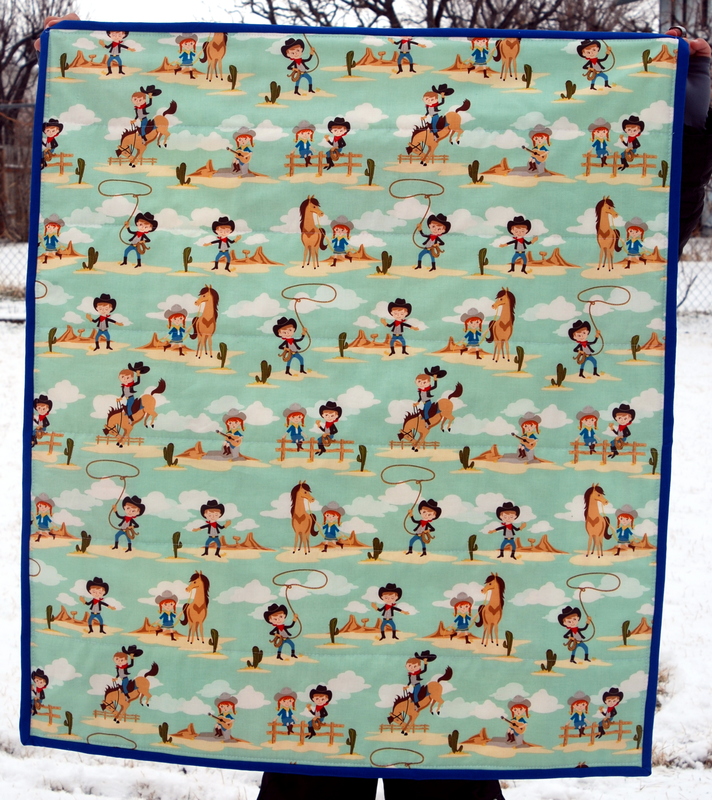 I backed it in the blue cowboy and cowgirl print from the same line, and bound it in a beautiful blue Kona Solid. 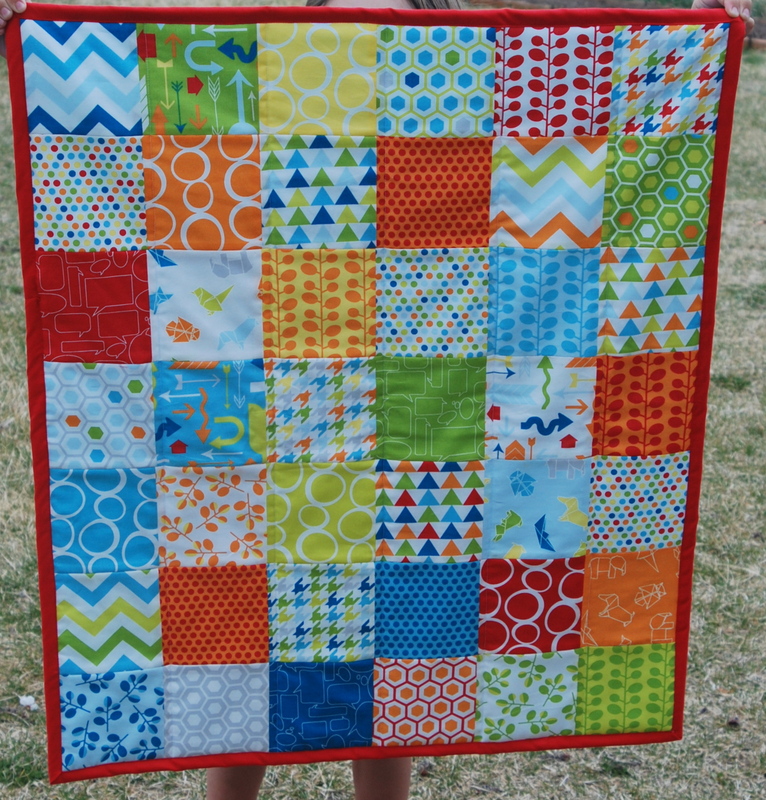 I quilted this one horizontally because I didn’t want to interfere too much with the fun backing. 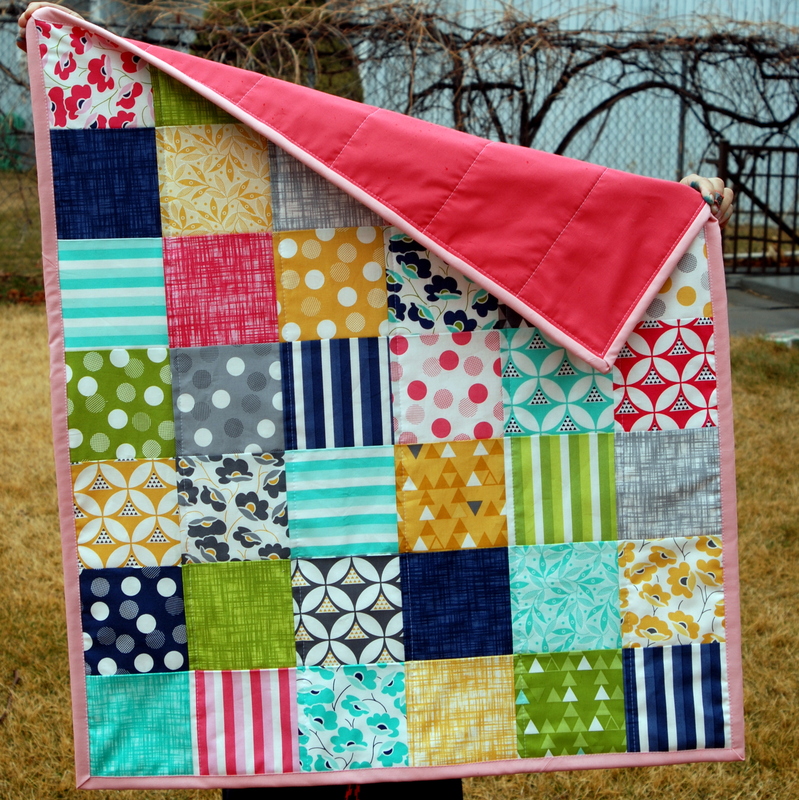 This quilt is made from Mixed Bag by Studio M for Moda. 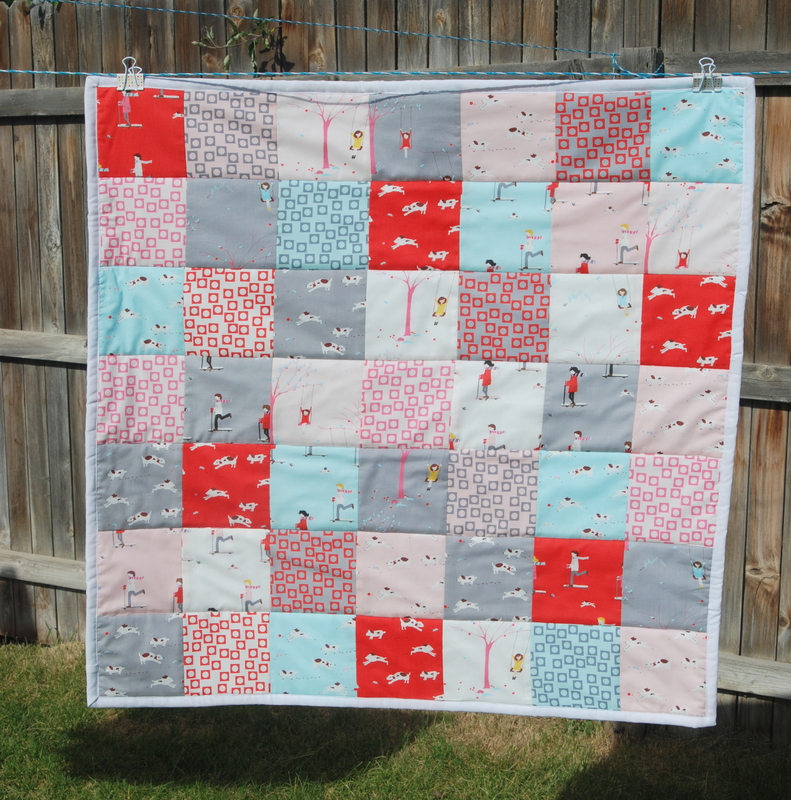 This is probably the most popular quilt I have made, as I have made and sold several! 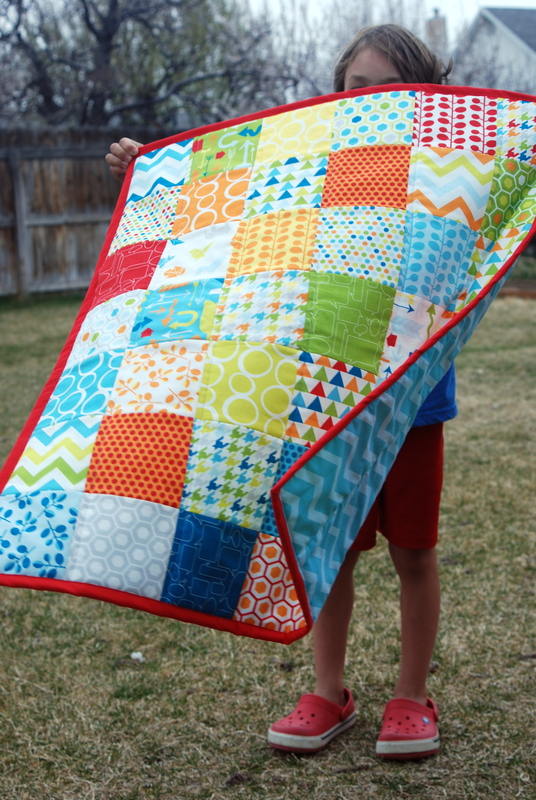 It is such a fun mix of prints and perfect for baby boys! 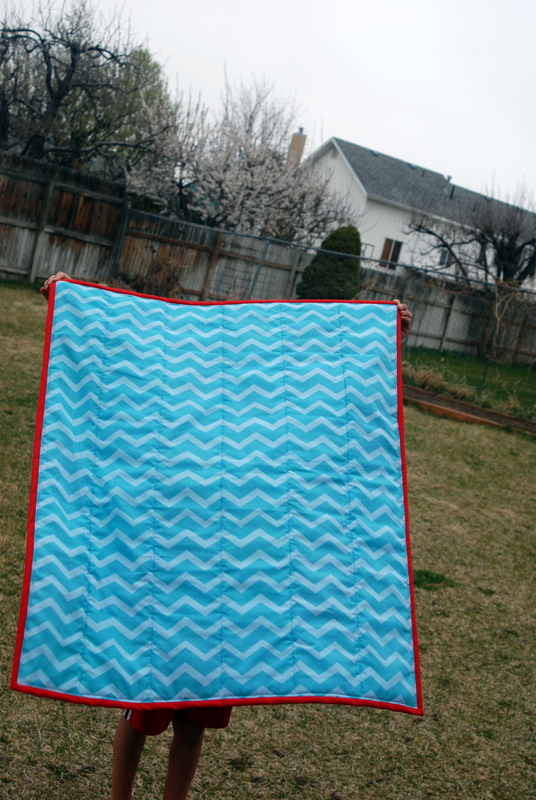 This one was backed with some awesome blue chevron (from Joann’s) and bound in a red Kona Solid. I quilted it vertically on one side of the squares. 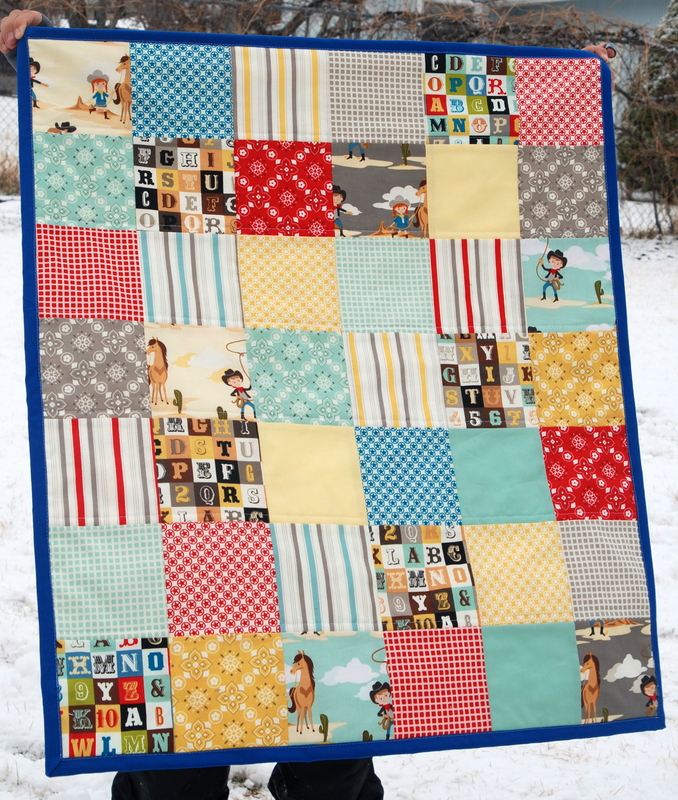 I showed this one in the last post, but this is one I made for my sweet little baby from Cozy Cottons by Robert Kaufman. Finally a little sweet one from Sherbet Pips by Aneela Hoey for Moda. This one I cheated a little bit because I had two charm packs and so only used some of the prints. But that is the beauty of charm packs! Use one, use two, use lots! 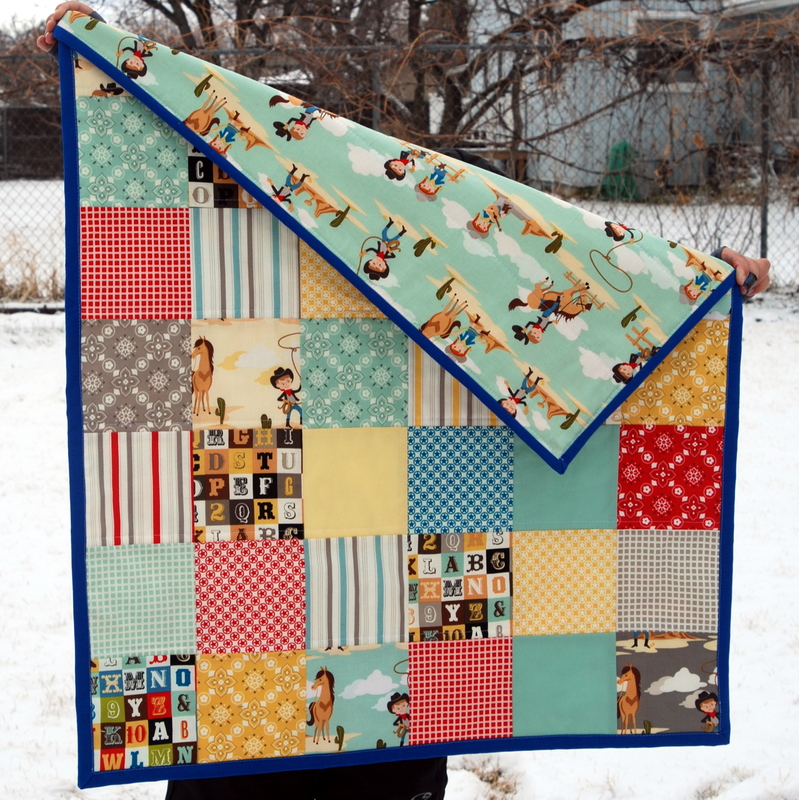 Use what you like and save the rest for something else… Anyway, here is the quilt. It is also in the shop. Aren’t those little dogs and girls swinging the cutest?